Baking this cake turned out to be a perfect example of Murphy’s Law in terms of planning. Whatever I had planned to do with it, went straight out of the window. I had promised myself to bake the next cake on a weekday, but as luck would have it, V decided to come home for lunch, right in the middle of mixing batter on speeds and demanded LUNCH! My oven had been pre-heated for so long, that it went off to zero and had to be re-heated once my batter and tin was ready. And if this wasn’t enough, to my utter dismay, we had to cancel our trip as V got fever in the evening. :( How I was looking forward to this trip only I know. Pune is full of must-see neighboring places during rainy season but since our move here 4 years ago, I haven’t been able to see much as pregnancy, infant and toddler kept me busy. Even this chance went for a toss. booo hooooo :( some more tears. To start from where we left, I made Eggless Banana Pound Cake with Coconut Cream Cheese Frosting for this month’s Sweet Punch with not so much PERFECT results. So I did a second attempt – for reasons see the earlier post. I used cocoa & Ricotta Cheese (paneer) for my recipe. I still added baking soda to it. Eggless Chocolate Ricotta Cheese Pound Cake – I replaced the eggs with Ricotta Cheese in this recipe – (1/4 cup paneer replaces 1 egg). This time I used my 8 inch round tin as I was planning to take this cake for a trek to Raigarh Ropeway and there were others to share. So I increased the quantity by 1/3rd maintaining the same proportion. Method – I replaced the egg with paneer in the steps. Use only home-made paneer. Preheat the oven to 180 C. Line & grease 8 inch pan. Puree the paneer in a blender till smooth. Lightly whisk together milk, paneer and vanilla in a medium bowl. Place dry ingredients in a large bowl and mix on low-speed for 30 secs, until blended. Add butter & half of the paneer mixture, and mix until dry ingredients are moistened. On medium speed beat for 1 minute. This will aerate and develop cake’s texture. Scrape down sides. Add the remaining paneer mixture in 2 batches, beating for 20 secs between each addition. Scrape down sides. Pour batter into prepared pan. Smooth surface with spatula. Baked for 45 mins. Let cake cool on a rack in the pan for 10 mins before inverting onto a greased wire rack. 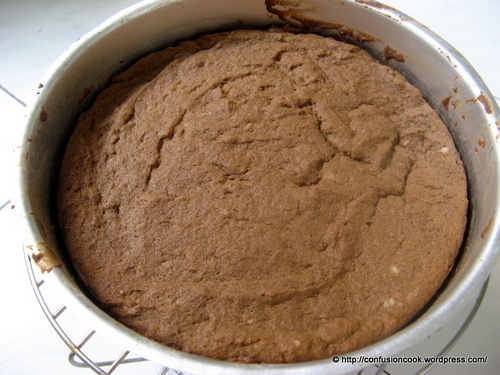 For making Cake flour at home – Take one cup of APF and remove 2 Tbsp from it. 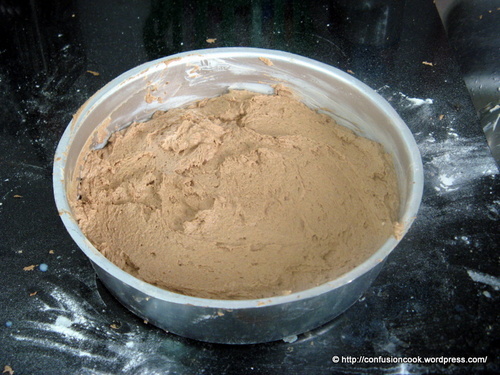 Replace 2 Tbsp flour with cornflour and sift together 2-3 times. Cake flour is ready to use. 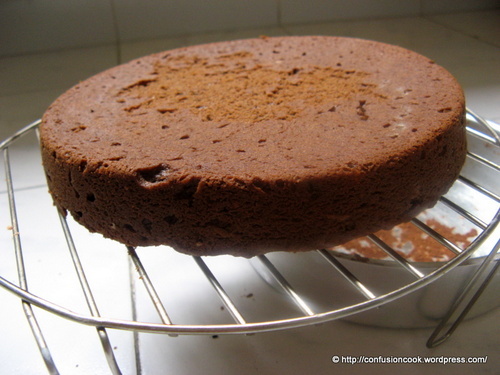 I removed 4 Tbsp from 2 cups of cake flour and replaced with 4 Tbsp of Cocoa Powder. I had read many times that replacing more than 2 eggs is very difficult, next to impossible. But I didn’t feel so. 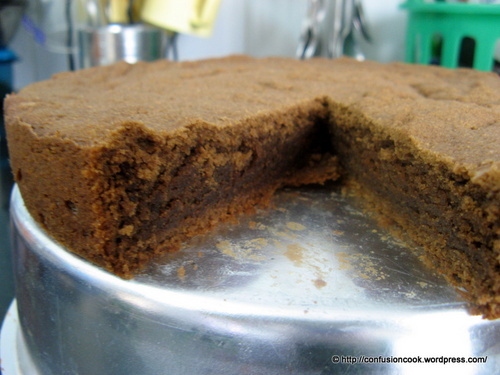 The cake was very good – moist, soft, crumbly, tasty. V couldn’t stop praising or eating. V praising is big because he drives me to tears many a times with his curt remarks about my cooking. So if he praised to the extent that this by far is the best cake I’ve baked then I believe him and you do so too. I felt that sugar was less and could have been increased more, which was due to addition of cocoa powder. But I didn’t alter any ratio as I wanted to maintain that. I sprinkled the cake with some powdered sugar and I was home. 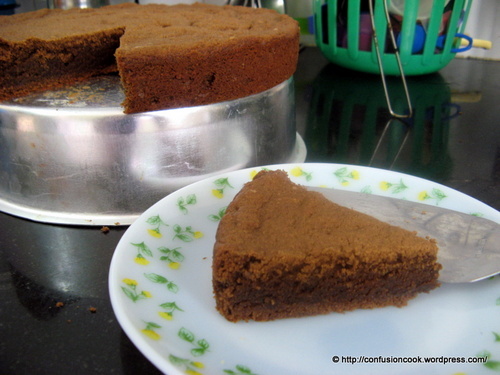 Since the cake was big and I didn’t want us piling kilos, I gave half to our dear friend & neighbor – They also loved it in equal measure as V. :) This one is for more Sweet Punch to experiment with!